After the huge instant success of the new Slot-O-Matic slot machine at their 3D casino, WinADay.com, online slots pioneer Slotland has discovered that while many players are attracted to elaborate new games, there is still quite an appetite for the simple pleasures of basic, uncomplicated games. From the week it launched, Slot-O-Matic has been the most popular game in the collection of six amazing slot machines and video poker games available in the 3D games lobby at the new WinADay.com. In its first week, Slot-O-Matic was played 30% more than the next most popular game on the site, Wheeler Dealer video poker. Most players have a favourite slot machine that they spend at least some time on pretty well every session. Most also like to take a break and try their luck on another game. Since its launch, most WinADay.com players have been spending at least part of their time on the new Slot-O-Matic. It’s become the favourite of many players. Many other players seem to find it a nice break from the more complex multi-payline games. Slot-O-Matic’s symbols, music, speed and graphic design are reminiscent of old-school gaming – but with a contemporary 3D casino twist. Many slots players like to build up their bankrolls playing single payline games before moving to multiple payline games. Single payline slots are great when you want to stretch out your playing for an evening, or even if you just want to save money for an hour or so but still have a chance to win. 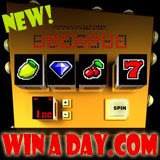 The new Slot-O-Matic is one of six instant-play, no download games at WinADay.com. Like all games on the site, it is tied to the WinADay.com progressive jackpot which is currently almost $150,000. This jackpot is separate from the progressive jackpot at Slotland.com which is nearing $200,000.